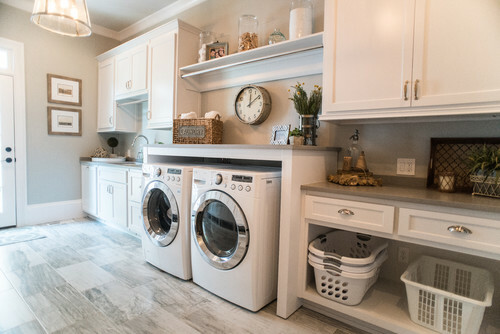 Oh, to have a nice spacious laundry room like this one. Unfortunately, I (and probably a lot of you) do not have this much space to dedicate to laundry. 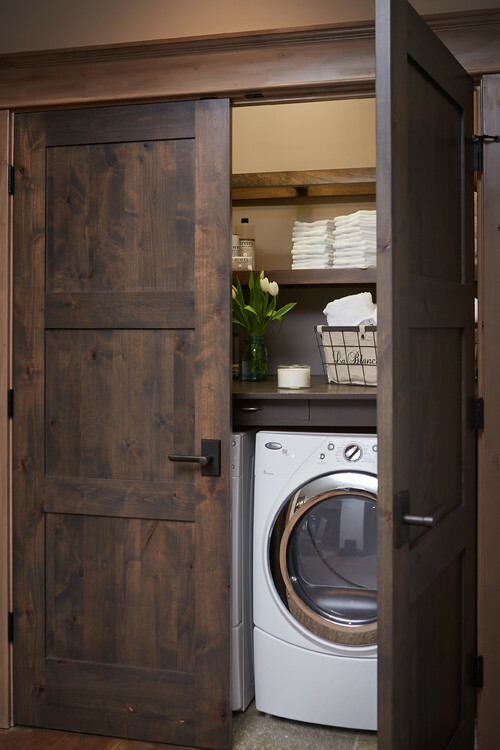 Most of us have a standard size laundry room. Then, there are others who struggle to find a way to incorporate their machines into their already cramped home design. Because let’s face it, not every home is built with consideration for washing and folding. 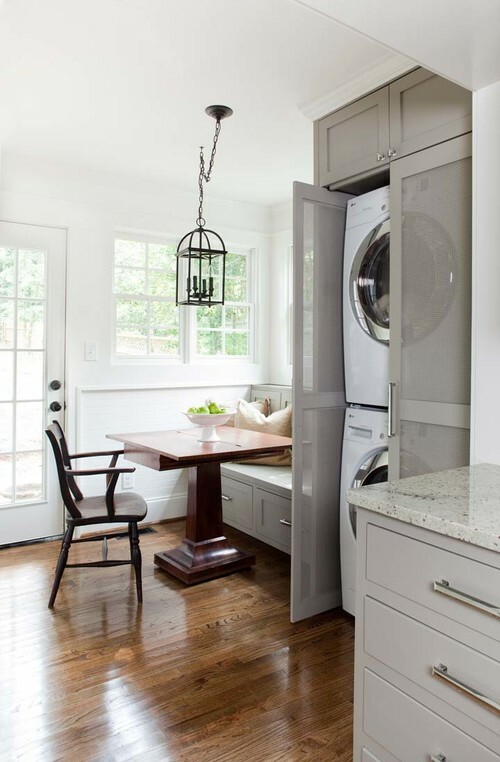 So, for those who need some inspiration for your laundry room solutions, this article is for you. The most common solution is to store machines in a semi closet space. This is the easiest solution if the hook ups are situated in a small recessed space. To help create a friendlier space, try adding a folding shelf just above the machines. Additional shelving can be a great way to store detergents and accessories. 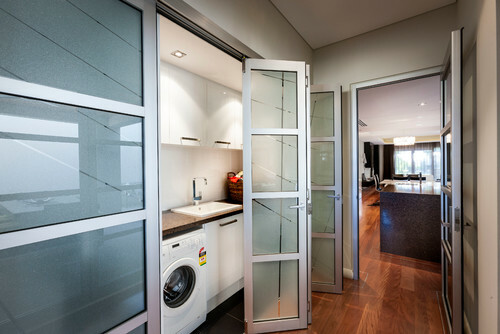 If you can only afford to give up a narrow space for your machines, a stacked set can easily fit behind a single or bifold door. If your laundry hook ups are located in an awkward space, such as the bedroom or between the kitchen/dining area, consider creating a faux bar or butler’s pantry. Purchase machines that allow for customized doors, and build the surround to double as a folding station and a second work station. A few good ideas for the secondary work station are breakfast bar (if near the kitchen) or a coffee bar (if in a bedroom). If your home doesn’t offer a dedicated space for laundry, the same concept for the bedroom can be used to create a space in the kitchen. 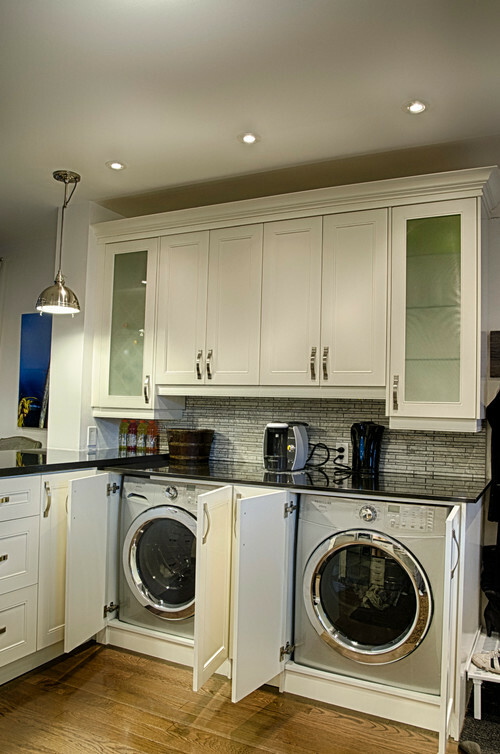 A few lower cabinets can be converted to give way to a home for your machines. When not in use, just close the cabinet doors and no one would be the wiser. But if you have enough room to extend your cabinets a bit farther down along the wall, a stacked set can be hidden behind matching cabinets. In addition to the cabinets used for a stacked set, consider the doors. 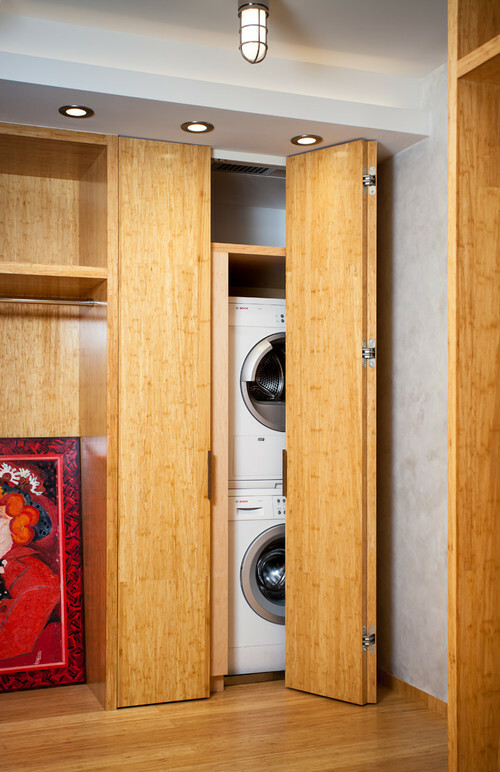 While standard or bifold doors are generally how a cabinet comes, think about requesting doors that pivot and slide back into the cabinet. This will keep the doors out of the way when it comes time to do the laundry. 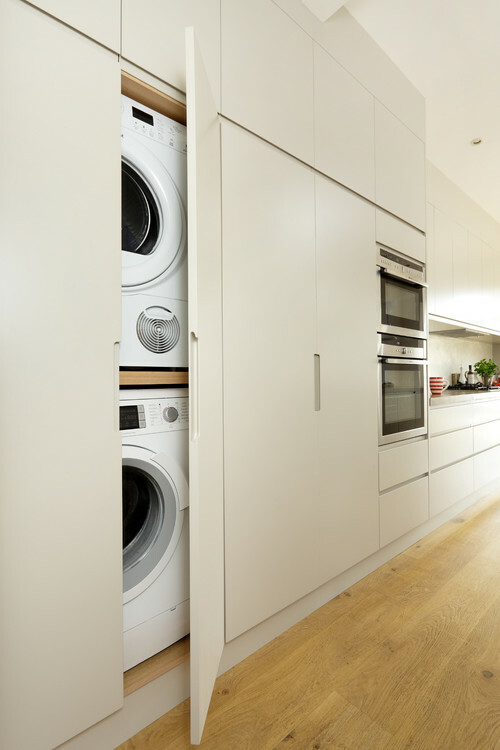 If space is really restricted, consider a washer/dryer combo hidden beneath a cabinet. Here, the sink is fully functional. Below, on the left, are storage shelving. On the right the combo washer/dryer is stored out of the way. Got a hallway with some extra width? Consider turning part of that space into one long laundry room with multiple bi-folding doors. Here, this Contemporary home has a fully equipped laundry room and wall cabinets that run the entire length of the hallway. 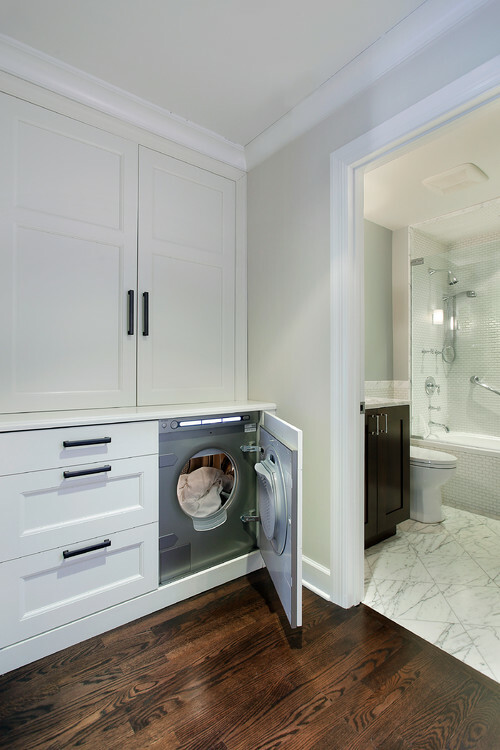 One new trend is to have a washer/dryer in the master closet area. If that is something that you would be interested in, think about how you want your layout. 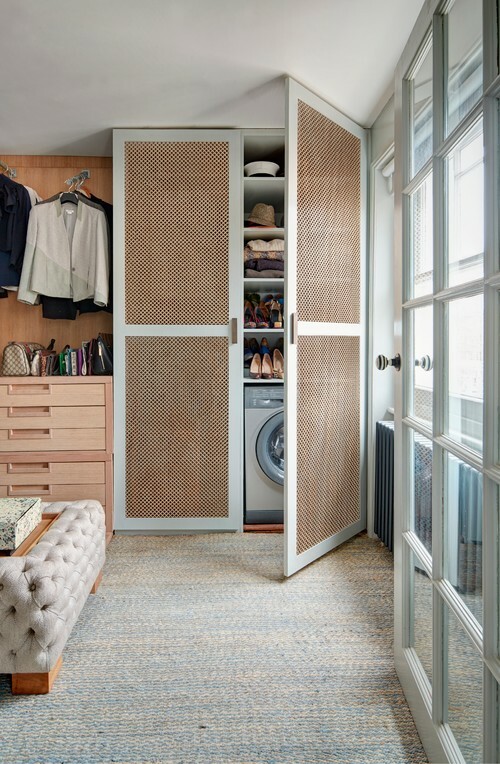 If on the other hand, you have a large closet but no laundry room, this may be the perfect solution as well. Notice how the machines are located inside this cabinet. Shoe racks are located above the dryer. The washer side is dedicated to detergents and supplies. Here the laundry nook was built out to double as laundry and linen storage. It was a great idea to disguise everything as a linen closet. When the upper doors are open, the countertop becomes a folding station. This was one of my favorites, but just didn’t fit into any of the other categories. What’s unique about this space? Well, it is part of a stairway landing. 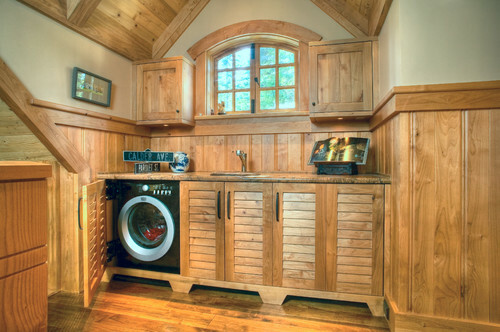 Instead of a built in bench seat, a nice little laundry station was added for second story wash and dry. 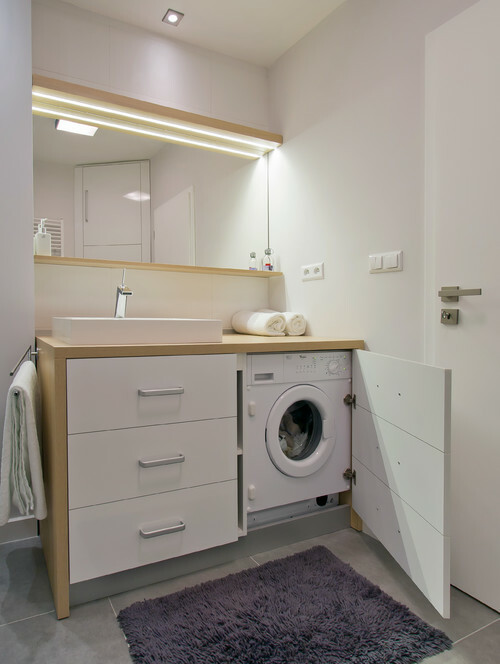 This allows visitors to do laundry without needing to go to the first floor level. I hope these laundry stations have inspired you to solve your laundry room (or lack of) problems. If you have a unique solution for where to put machines when space is limited, please share it with us.